We believe one of Moab’s greatest assets is a strong, healthy, and connected community. 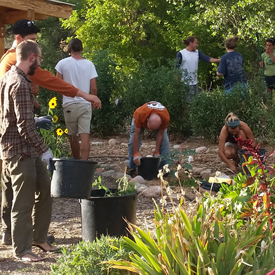 We provide a variety of Events in Moab to nurture and strengthen our community while also providing opportunities for individuals in Moab to learn and gain new skills. Learn more about our offerings below, and check out the calendar for upcoming events. We look forward to you joining us and becoming connected to the Youth Garden Project through one or more of these programs. Every other Wednesday, from April – October, we invite the community to help us with on-site projects. In exchange we cook a healthy dinner for everyone with most ingredients sourced from the garden. Learn more here. 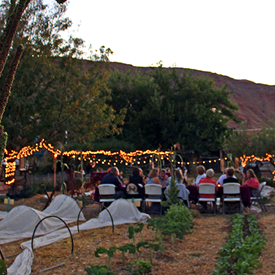 Guest chefs prepare a four-course dinner using fresh local ingredients from our garden and other local farms. Guests are seated in nooks throughout the garden to enjoy the handcrafted local faire and are served by YGP staff. Two Sunday brunches coming in 2019! We hope you will join us! Learn more. In late winter and early spring our garden crew develops a wide (wide!) variety of plant starts to be sold to the community. 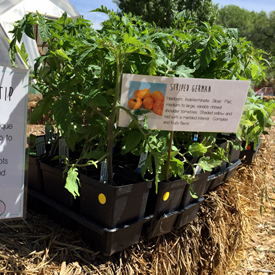 Find native plants for your yard, the best tomatoes to grow in the desert, and so much more at our Annual Plant Sale. Learn More.